Check Out Our NYC Inspired VIP Lounge! 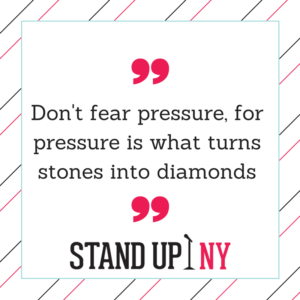 Thanks to Marney Miller, Stand Up NY was able to add beautiful artwork to our V.I.P. section, making it even more special for those Very Important Persons’. Marney Miller is a mixed media painter currently in the process of receiving a BFA in Studio Art and BA in Art History from New York University. She is originally from Albany, NY, but now lives in NYC. Being born and raised in New York, and continuing her studies in New York, we couldn’t think of a better artist to fill our V.I.P. 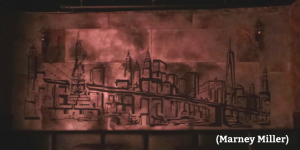 lounge with her artwork of our home: New York City. 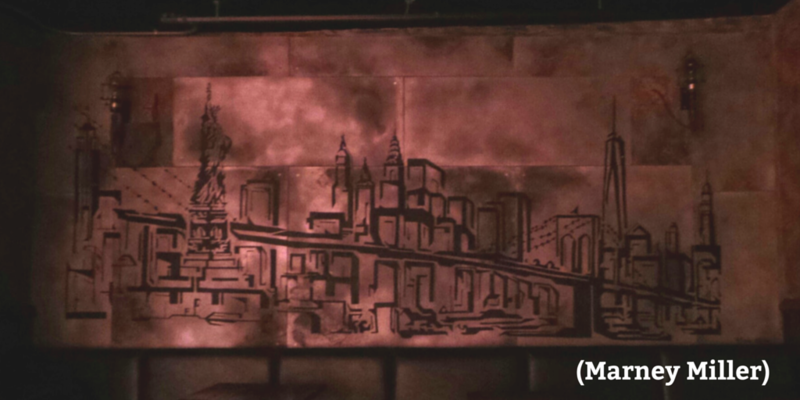 Be sure to check out the lovely skyline behind the booth next time you stop by Stand Up NY. It surely is a sight to see, and we are so proud to call it ours. Awesome job Marney! This week is New York City’s Pride week. Pride Week is dedicated to the members of the LGBT community, by letting them know their city supports Gay Pride and LGBT communities everywhere. This weekend on Sunday, June 26th the annual Pride Fest will take place attracting visitors and locals in the celebration of equality. 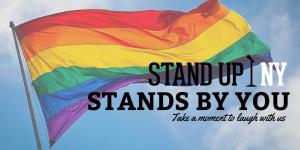 As part of NYC’s community, Stand Up NY too, would like to celebrate Pride Week. During Pride Week if you come to any of our shows wearing something rainbow or showing your pride and support for the LGBT community your cover will be FREE. With all the colors, music, and celebration during Pride Week, don’t stay inside. Come to Stand Up NY and show your pride anytime this week for your free entry to a night full of laughter. The impact both the entertainment and comedy worlds step up to make during times when our country is suffering gives me hope for our future. People are constantly fighting over whether the technology and mass media in today’s culture is positive or negative, and personally I could attest to both sides. Then I ask myself, what is the point? What is the point in another fight? Today it feels like everyone in America is fighting for or about something. When events occur like the tragic shooting in Orlando on June 12th, it puts the media in a very unique position; everyone is looking to media for answers. It puts the world of comedy in an even more unique position because there is always the question “Is it okay to laugh right now?” There is currently a video trending on Facebook of comedian Jimmy Fallon commenting on this tragedy. In this video Jimmy points out a possible lesson we can learn from this a event that is so hard for so many of us to wrap our heads around. This lesson is for us to “get back to being brave enough to accept that we have different opinions, and that’s okay because that’s what America is built on”. It is so hard to believe that in a country where freedom is our advertisement, that one of our biggest issues is people being punished for living their lives the way they choose and speaking their mind. The thought all of this brings me to while spending my summer in New York is September 11th. The weeks after September 11th were tough on everyone. It was like the world wanted to stop time, but the globe had to keep spinning; and with that, so did the media. SNL was put on the spotlight during this time. They were unsure if they should run their show in fear of how people would react to comedy while the entire country is suffering and scared. The move SNL made has now made history. With immense support for New York and those affected by the terrorist attack, SNL decided the show must go on. SNL discovered the power of laughter and using comedy as an outlet for America during the darkest of days. Here at Stand Up NY we too want to do our part in helping our community get back on their feet and inspire people to be brave enough to accept differences. There is so much good in this world. It is times like these we need to focus on that good and spread that instead of the hate. 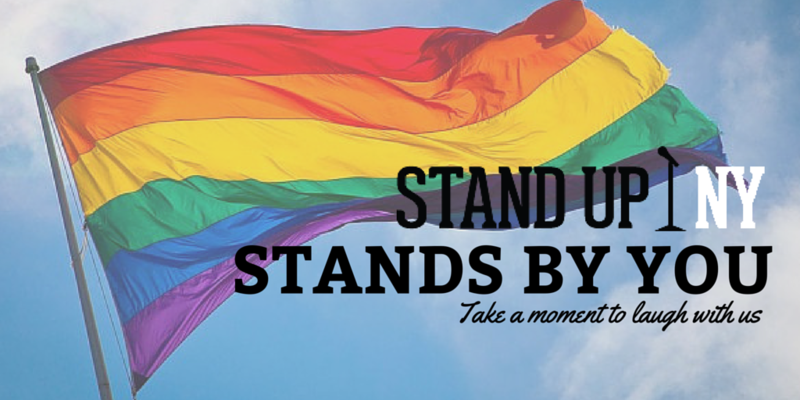 Stand Up NY wants to support the LBGT community by encouraging everyone to come together, relax, and laugh. 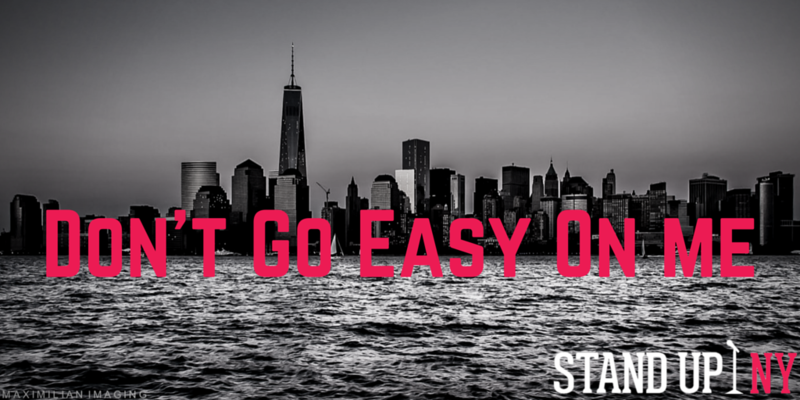 It doesn’t matter who you are or what you think at Stand Up NY. Everyone’s here for one reason—to laugh. We will be hosting a show on in the next few weeks (stay posted) where all proceeds from tickets sales will go to the LBGT charity of participating members choice. 49 good people are gone. It is our job as American citizens to make up for their loss in our community and the impact they would have made. 49 people are gone, we now have even more space to be pushed together and stand hand in hand. I just moved to the big bad city of New York about a month ago. Originally being from Chicago, I’m used to the fast pace and city streets, but there is one thing about New York that no other city can take away from it. New York is the second largest city in the world, which means it is full of all different kinds of people. As a student who just returned from studying in Barcelona, I must say I have arrived to New York with an advantage. This advantage stems from my experience with interacting with international people. Being in NYC I can feel how my confidence has expanded and enabled me to step out of the box and experience the world just how I did in Europe. The other day after working here at Stand UP NY I decided to go to Central Park with no mission but to open up my mind and enjoy the beautiful late afternoon. Never in my life would I have guessed what happened next; I have been called outgoing and bold before, but even for me this was huge. The rest of my afternoon consisted of sitting in a circle surrounded by people around the age of 60+ singing and playing the guitar. I immersed myself into this group and between the songs and laughter, there were conversations. I left this circle in Central Park having learned life lessons and other inspiring information; I never would have if I didn’t decide to take the day on myself, confidently, by the seat of my pants. Not only did my day in the park provoke confidence in myself, but it also widened my eyes to all this amazing city has to offer. I’m always talking about how incredible it is that these Stand-Up comedians have the tenacity to get up on stage and not know how the audience is going to laugh. As I’m taking my baby steps in taking on this world, they’re going up there and fearlessly making people laugh. Anyway, there are so many different ways you can take advantage of your time in New York City and I just wanted to let everyone know if I can do it if comedians can get up on stage, then everyone can take steps out of their own little comfort box and get to know NYC in a different way. Take a walk through Central Park like me, start a conversation to the person next to you at the bar, make a bucket list, come and perform at an Open Mic with your friends–I don’t care; just get out there! There’s a world of information out there that could help you find something inside that you never knew you had or loved. Why wait any longer to find out? We could all be the next something great. For more information on Stand Up NY’s open mic night, visit their sign-up page! Or grab friends and family and be a part of the audience at one of their comedy showcases 7 nights/ week! When I think of comedians I often overt my memory back to the middle school days and think of the classic obnoxious yet witty class clown. Even in college, there will always be those people who have the constant need to bring the attention to themselves. But are these the people who turn to being a stand-up comedian? In some cases, yes, but in most cases stand-up comedians don’t fit that stereotype. Have you ever thought of what it’s like to stand up in front of a crowd starring at you just waiting for you to make them laugh? The pressure of being funny can be intense; and although there are many people that think they are funny, only a select few are correct. It takes someone brave to get up on a stand-up stage and break through the awkward silence, and fear of being defeated starring at you in the face. On that account, just like anything else: practice makes perfect. Whether you’re a comedian with a fear of the audience or delivering your joke, the number one tip for becoming more comfortable and successful on stage is bringing out the brave and putting yourself out there. 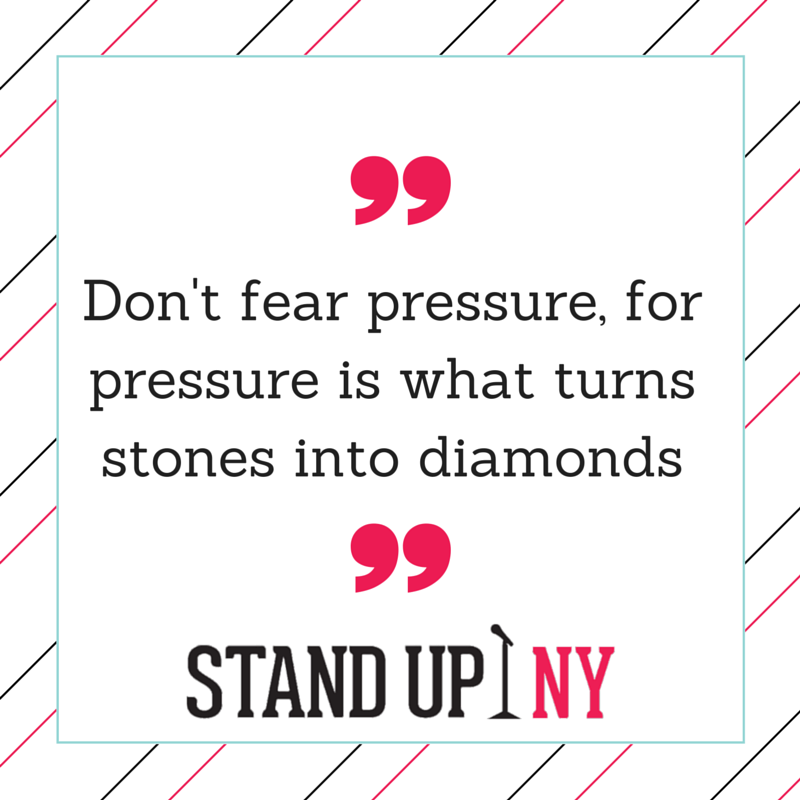 Here at Stand Up NY we give new comedians an opportunity to practice every night at 5PM with our Open Mic. If you’re a start up or veteran comedian you can sign up for our Open Mic on our website at http://bit.ly/19rtUWM. Follow the link and sign up using pay pal. Open Mic at Stand Up NY is an awesome chance for aspiring comedians to gain more experience on stage and make some quick cash!